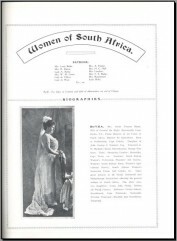 This publication lists over 1500 biographies of prominent Women of South Africa for the year 1913. Biographies include their marital status as well as their husband’s names. It gives details of where they were born and educated. It also sometimes includes their parents’ names, how many children they had and their residential addresses. Their social and charitable roles are also discussed. If your ancestor is listed here you would gain an enormous amount of information and most likely a portrait too! The publication is completely indexed by married and maiden names. Also included are over 1200 portraits.